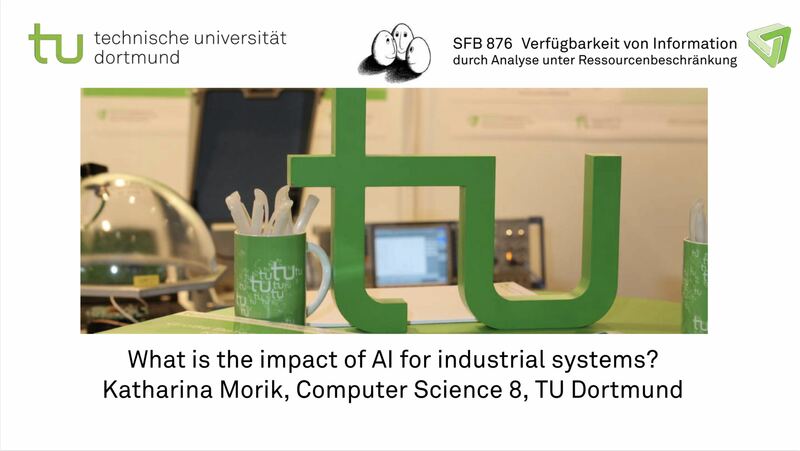 What is the impact of AI for industrial systems Speaker: Prof. Dr. Katharina Morik, Chair of Artificial Intelligence, TU Dortmund University Download the talk: here AI has raised some interest, recently. The driving force behind this hype is machine learning, in particular deep learning. This talk sketches the current hot topics and then focuses on what is relevant for applications in industrial processes. Prof. Dr. Katharina Morik Head of Artificial Intelligence Unit, Chair of Artificial Intelligence, TU Dortmund University Katharina Morik obtained her PhD from University of Hamburg in 1981 and her habilitation from Technical University of Berlin in 1988. 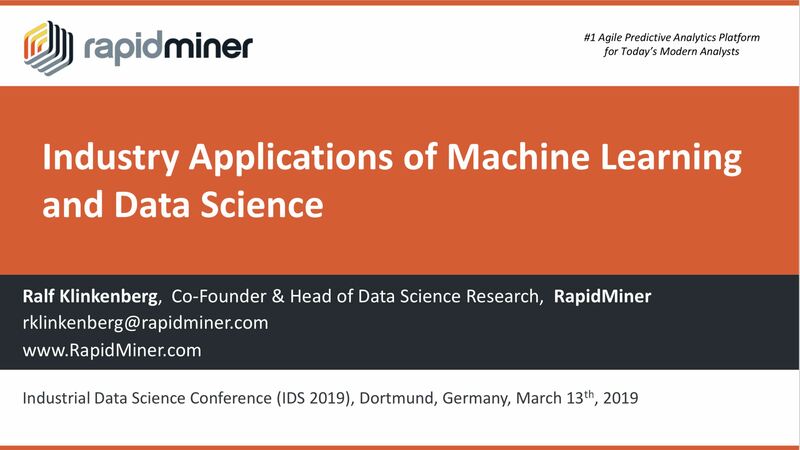 Industry Applications of Machine Learning and Data Science Speaker: Ralf Klinkenberg, RapidMiner Download the talk: here This presentation provides an overview of industry applications of machine learning and predictive analytics in the automotive, aviation, chemical, manufacturing, pharmaceutical, steel, and other industries covering the following use cases: Predictive Maintenance: Predicting and Preventing Machine Failures before they happen. Prediction, Prevention, and Resolution of Critical Situations in Continuous Production Processes. Product Quality Prediction in early stages of the production process. Success Factors for Industrial Data Science Projects Speaker: Prof. Dr.-Ing. 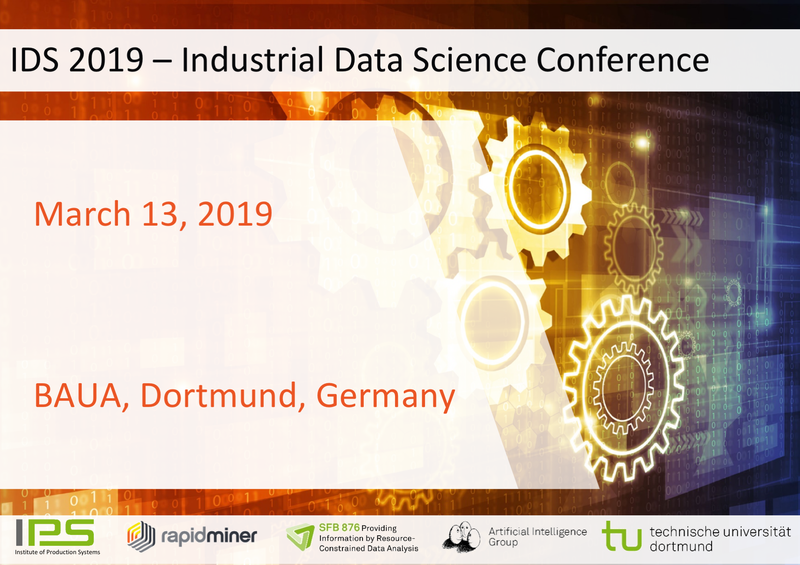 Jochen Deuse, Institut of Production Systems, TU Dortmund University The modern industrial production environment receives strong impulses through an ever increasing use of data science methods for optimization purposes. In particular, the consideration of three essential success factors is of great importance for the efficient implementation of such industrial data science projects. Firstly, the project-internal procedure must be aligned with a structured procedure model, such as the CRISP-DM. 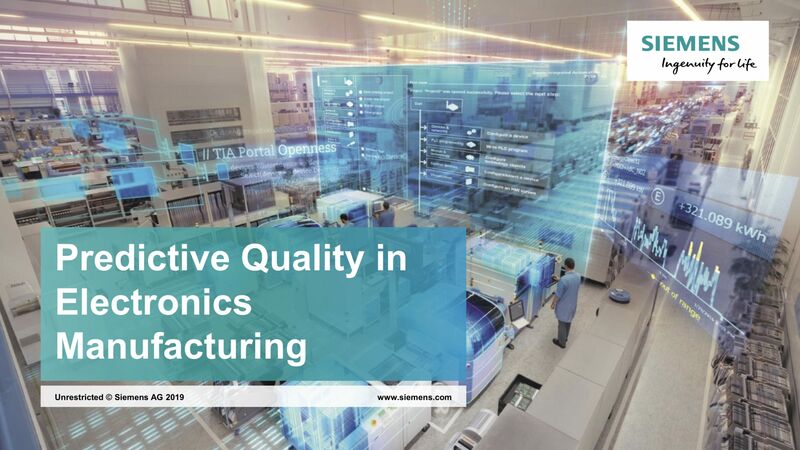 Predictive Quality in Electronics Manufacturing Speaker: Dr.-Ing. Jochen Böning, Siemens AG Download the talk: here Due to the increasing competitive pressure of globalization, the production of high-quality products is crucial for the long-term success of a company. In order to guarantee the delivery and transfer of faultless products, it is therefore essential to ensure quality. In the classical sense, this is in turn associated with high testing volumes, so that on the one hand high investments are made for testing equipment and on the other hand high testing costs are incurred. Data Science Enablement in Automotive Industry Speaker: Michael Harms, Jaguar Land Rover In order to leverage the power of data science, it has been necessary to ensure the technology stack meets the needs of our analyst community and that the correct technical skills are in place to compliment the domain-knowledge across the functions. This presentation explains some of the challenges faced on the journey to becoming a more analytical organisation and the success stories that data science has brought. Integrating Freight Flow Predictions for Shift Planning into an Enterprise-Ready Setup Speaker: Dr. Max Pillong, Lufthansa Industry Solutions Accurate freight flow predictions allow better shift planning and resource allocation. This presentation describes how RapidMiner can be used to integrate predictive analytics into an existing IT architecture built on diverse platforms and including third-party providers. The generated forecasts allow for precise freight flow predictions based on location, day of the week, and even down to a shift level, enabling Lufthansa Industry Solutions’ customers to precisely schedule shifts and their required manpower. Cognitive Diagnosis - Automation of Field Data Analysis Speaker: Martina Ringeln, Miele & Cie. KG The analysis of field data as a basis for continuous optimization of products and processes is one core area of a sustainable quality management. In the field of consumer products especially the evaluation of customer and service data to identify defects is complicated by an unstructured and heterogeneous presence of data. This presentation gives an insight how text mining and data mining are applied to field data at Miele and how Miele is going to improve the staff deployment for handling unstructured texts. Data-Driven Process Optimization in Beverage Industry Speaker: Dominik Polster, Bitburger Braugruppe GmbH Increased price and competitive pressure as well as initiatives to increase energy and resource efficiency present the beverage industry with major challenges for rationalization. In the presentation, the possibilities and limits of existing approaches to data-based process optimization will be presented and it will be shown that new approaches to data analysis are required for biochemical processes with complex combinations of different influencing variables.